After yesterday’s post about disorderly persons in early Michigan laws, reader Ann Curtis Collins was puzzled. Great question, even if The Legal Genealogist can’t give as detailed an answer as any of us might like. First off, it’s clear that Michigan was hardly alone in regarding puppet shows as potentially disruptive and disorderly.1 Laws were on the books in many parts of the United States, and not just in Michigan. Now… putting all this together, what do we have? We have what might pass as prudery in Italy, worries about anti-government subversion in England and France, and what was clearly a concern about traveling players in the United States. People who went from town to town, weren’t regular residents, and might pose a risk to the public order. Nobody ever comes right out and says it, but we can read between the lines: everybody thought these were folks who might fleece the locals if they didn’t rile them up against the powers that be — or both! Puppets, history, and the law. Thanks for researching and sharing this Judy. I never would have known that. Fascinating! I live in Minneapolis, where puppets are a big thing–literally. We have several wonderful puppet theaters, including In the Heart of the Beast, which sponsors an amazing May Day parade and pageant with huge puppets to honor nature and diversity, welcome spring, and inspire creativity; Barebones, which produces a terrific Halloween show with giant puppets, and others. Both of our daughters grew up participating in these community activities and are still involved. Our younger daughter, a visual artist, first worked after high school in a puppet-making studio where she learned to make shadow puppets and put on shows. This post is definitely being shared via Facebook. 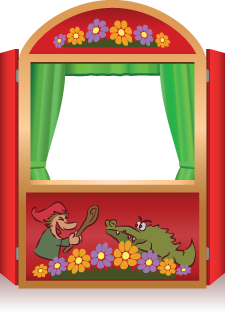 Part of the context of the puppet show is the commedia dell’arte, which has a deep political satirical history in Italy and France. Also see Punch and Judy, https://en.wikipedia.org/wiki/Punch_and_Judy. Brought to mind the Wayang Kulit shadow puppets medieval India.